You are here: Home » Meet Koi! I haven’t had a lot of time to bake or cook recently – our family recently adopted a dog! 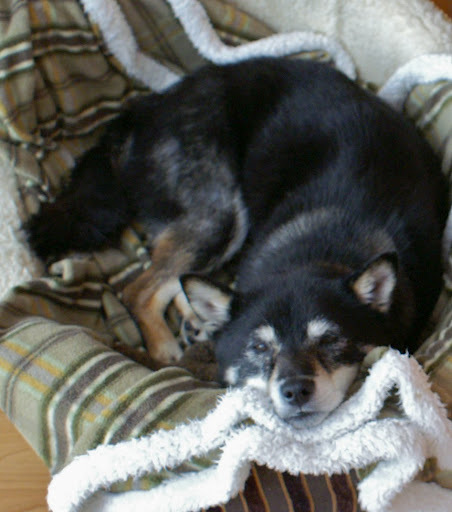 This is our family’s first dog – her name is Koi and she’s an 8 yr old Shiba Inu and totally adorable and cute! The Mothership is her primary carer and Koi lives with her. The Mothership does all the daily care, but I stop in every day after work to take Koi for a walk and on the weekends, I spend a bit more time with her and thus, the baking has taken a backseat to the newest member of our family. But it’s worth it! I’ve only made one thing notable recently – just a twist on the blueberry lemon bundt – I mixed it up by baking with some fresh blackberries I picked and it was a great success! I am trying to ramp up my energies for the next couple of months because birthday season is LITERALLY just around the corner! I have my first cake next week! I am actually thinking of making a “Koi” cake – kind of like a tiger cake – a combination of black, white, and brown/orange elements. This is generally a combination of different flavours of those colors – whether it is chocolate, vanilla, caramel, orange, etc. I have a couple of ideas floating around the ol’ noggin, so let’s see what I can conjure up. I also have an exciting story about something I did yesterday – a day-long chocolate making class! WOW! What an experience. My arms are still sore from mixing, folding, stirring, and working chocolate for the whole day. If the classes weren’t so expensive, I would do the entire 6-session course, but for now, this was my birthday treat. Thanks, Spoon – I had a great time and now have enough chocolate for the next few months! ← This Pizza’s Made for Grillin’!